EDITOR’S NOTE: This is the final story I wrote in 2012. It has been published in the January edition of Women’s Pro Rodeo News, the official publication of the WPRA. During the 2012 Wrangler National Finals Rodeo, I wrote the nightly WPRA.com updates from Las Vegas, so I visited with Mary Walker several times over that 10-day stretch. In each post about Walker, I worked hard to focus on her run at the NFR, not the challenges she’d suffered leading up to her first qualification. For the magazine piece, I let it all hang out. The interview we did less than 24 hours after she earned gold was touching, emotional and, at points, a little overwhelming. I am truly inspired, and I hope the story reflects that. When a child dies, life can become unimaginable. The grief is overwhelming, and living each day is a challenge. To make it through, it takes the mind of a champion, the willingness to maneuver through this world through the heartache, the despair, the roller coasters this life has delivered. Mary Walker knows every step of that process, from the days of not wanting to get out of bed because her heart hurt just too much to the days of finding the will to saddle a horse and ride in the grassland. She has the mind of a champion. She has the heart of a world champion. Reagon Walker died in April 2011, the victim of a car wreck. He was 21 years old – just old enough to begin living his adult life and way too young to die. But young people die each day, and Byron and Mary Walker know that all too well. They said goodbye to their baby boy when the rest of us can only imagine the what-ifs, the pain. That was just the first – and most painful – situation in the most challenging of her 53 years. Less than two months later, she and her great horse, Perculatin, went down during a barrel race. She shattered her pelvis, broke her hip in three places, had two fractured vertebrae and suffered two broken toes. She had surgery, where doctors used eight plates and 11 pins to stabilize her hip, and she was in a wheelchair for about four months. Every inch rolled in that chair turned into motivation, but that’s what happens inside the hearts of world champions. That horse is an 8-year-old black gelding she calls Latte, out of Curiocity Corners by Dash for Perks. “Byron purchased him for me on May 17, 2011,” Walker said. “I had actually been riding him six months prior to that. The girl who owned him wanted him finished out for a rodeo horse. I got my hands on him, and I had to teach him how to run. I knew there was something in him that I needed to get out. It took a little time for Walker to rehabilitate her injuries. In the interim, Byron Walker mounted Latte three or four days a week, but they didn’t run the pattern together. When Mary Walker was cleared to ride again, she and Latte went to work. “I bet he was glad to get that heavy saddle off him,” she said. He must have been quite happy. He responded to everything that happened afterward, from running at small rodeos in Texas to winning the “Daddy of ’em All,” Cheyenne (Wyo.) Frontier Days. In all, Walker and Latte won more than a dozen rodeo titles, from Ada, Okla., to Window Rock, Ariz., to the All-American ProRodeo Finals. Oh, and Latte was named WPRA/AQHA Horse of the Year. Byron Walker is the 1981 world champion steer wrestler who competed at the NFR 16 times. His gold buckle win came 31 years ago, and it was directly after he led the world standings in earnings in a previous year. The only reason he didn’t win gold earlier was because the Professional Rodeo Cowboys Association had changed the rules to rewarding the highest NFR money earners with the world titles. That’s how Chris LeDoux won his world tile, even though Joe Alexander had earned $19,000 more than the No. 2 man on the money list. Byron Walker finished atop the money list in 1978 and was runner-up in 1979. And after 16 times in the sport’s grand finale, he knows a thing or two about what it takes to compete at a high level. About 40 years ago, Byron Walker and Roy Cooper stood side by side for a photo showing off their championship saddles. That was 1973. The young men vowed then to take a photo together when they had won ProRodeo’s gold. They did just eight years later. Fast forward a few decades. 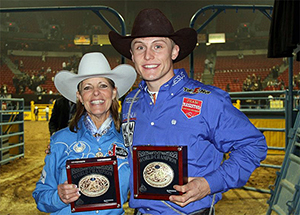 Tuf Cooper and Reagon Walker had won the Texas High School Rodeo Association in their respective events – Tuf in tie-down roping; Reagon in bulldogging. The next photo to come was to be in Las Vegas after they’d clinched their Montana Silversmiths gold buckles. When Reagon Walker died in 2011, those dreams died with him. But nights reveal blissful rest and wondrous dreams. They come true in the rarest of fashions. Mary Walker had a lot of great moments in 2012. Her greatest? That happened during the first Montana Silversmiths Go-Round Buckle Presentation at the South Point Hotel & Casino, which took place each night of the Wrangler NFR. It was in Las Vegas where Walker excelled. She won the first three go-rounds, then again in the seventh. She also placed on four other nights. In all, she won $146,941 in 10 nights in the City of Lights, earning more money inside the Thomas & Mack Center than anyone else. For that, she earned a pickup for winning the Ram Trucks Top Gun Award. She finished the season with $274,233, about $70,000 ahead of the No. 2 cowgirl in the land, Carlee Pierce of Stephenville, Texas. Many people were speechless for the Walkers. Few could imagine what it’s like to lose a child; more could never understand how someone could dream of competing at an elite level after such pain and sacrifice. 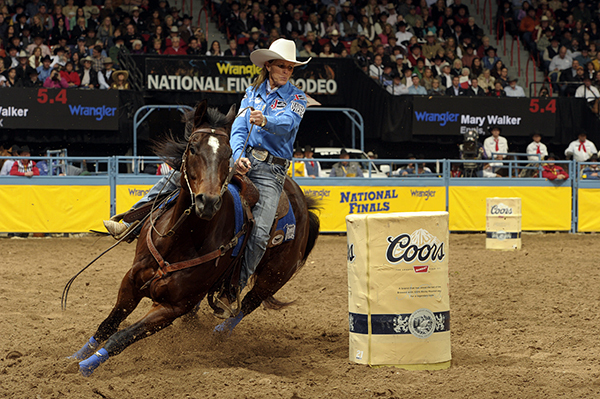 Mary Walker qualified for her first Wrangler NFR third in the world standings, chasing a couple of two-time world champions, Brittany Pozzi of Victoria, Texas, and Lindsay Sears of Nanton, Alberta. She’d been to the finals every year since 1977, but she had no idea what to expect as a competitor. That’s why the Walkers had plenty of help, and she realized on the first night the importance of a solid team, but there was much for Mary to figure out on her own. Apparently, she got it all figured out. Mary Walker was the fan favorite for many reasons. Her brilliant smile was the fuse that lit the City of Lights during those 10 nights; her passion and compassion were the honored guests of the Nevada desert. She handled every step along the rocky and challenging path with the grace of a champion.